Autumn has me on the hunt for boots, sweaters, and coats, and I've slowly been crossing things off my wish list...expect to see lots of Helmut Lang, AllSaints, and Alexander Wang in the next couple of posts. 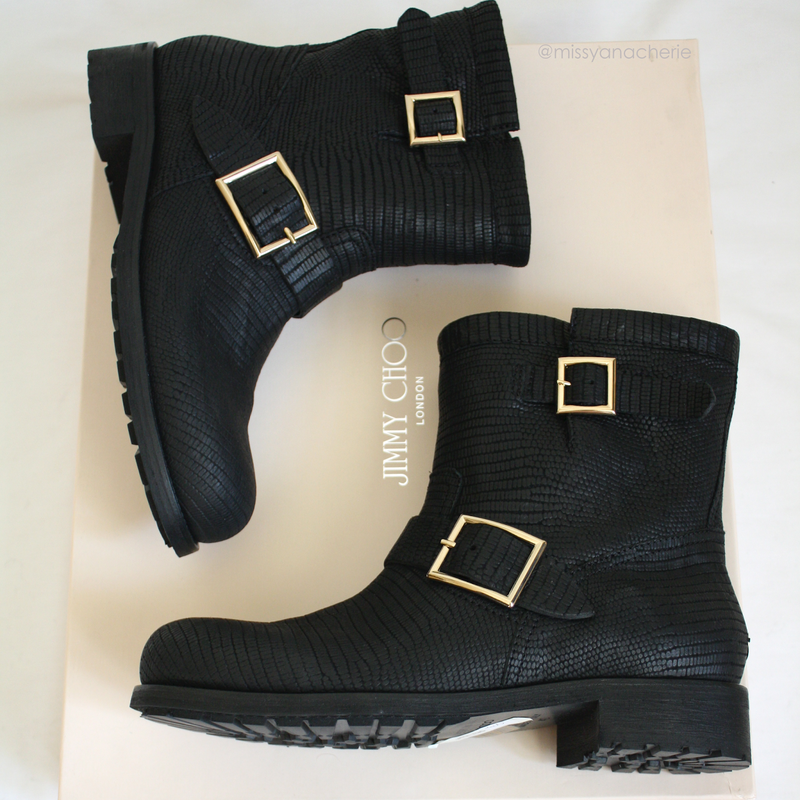 ;) I finally purchased the Jimmy Choo Youth lizard embossed boots from eBay, my new favorite place to shop. I originally wanted the standard leather ones, which are lovely, but I think the simple nature of the boot practically mandates the textural enhancement. The Youth boot is available in various colors, skins, and textures - navy suede, camel suede, blue/gray suede, burgundy suede, pebbled light gray leather, leopard print, distressed leather, black crystal, brown leather, metallic gray, studded suede, and black waxed suede, to name a few. 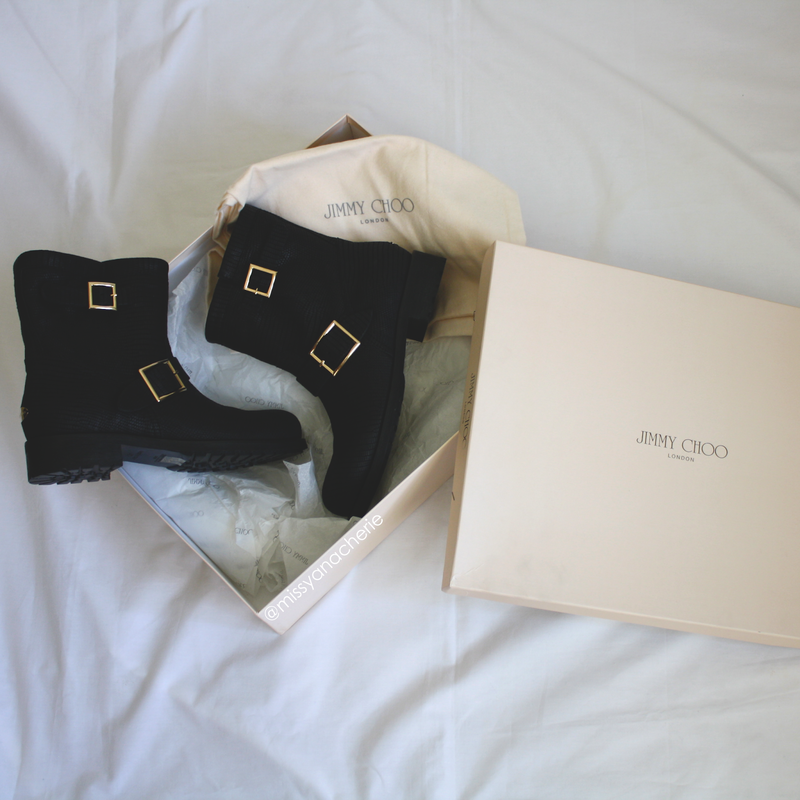 There is also a taller version and models with shearling or with rabbit fur on the inside. The simple black ones are discounted at BlueFly and Farfetch but are available at full price from Bergdorf's, Jimmy Choo, Nordstrom, Neiman's, Saks, and Net-A-Porter. I first spotted these at Saks, then eyed them soon after on a French girl at Ladurée in SoHo. I hope she didn't notice me furtively stealing glances down at her feet as we both waited in line...do the things you want to buy follow you around incessantly, too? The Youth boot is a very simple, standard motorcycle boot with a chunky heel and adjustable buckles. 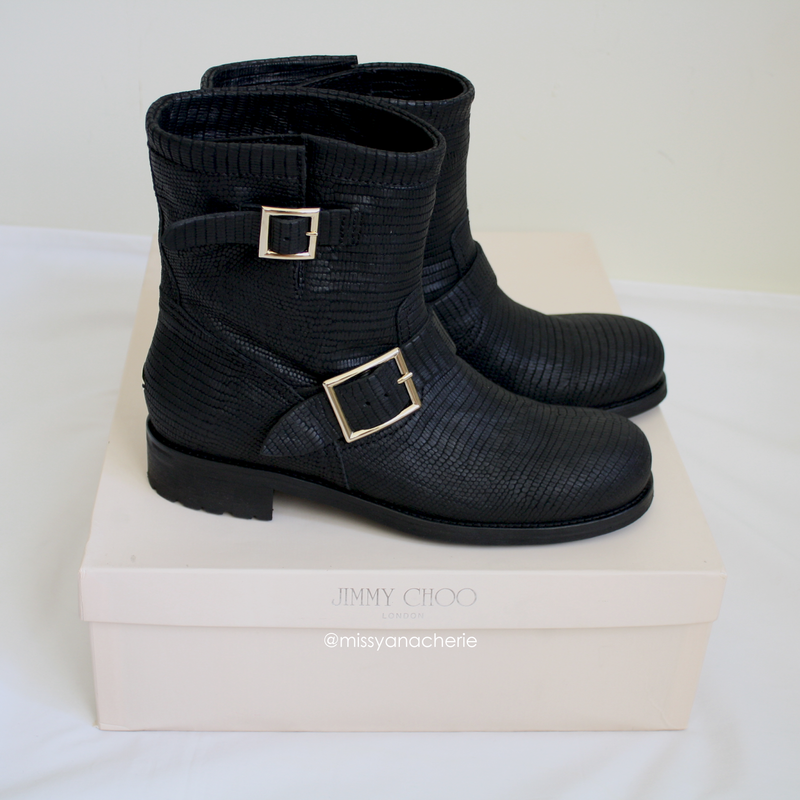 The boots look great with jeans or skirts; you are able to adjust the width around the calf, allowing more flexibility. Like many Choos, these have a characteristic miniature metal plaque proclaiming their ~*esteemed status*~ in the shoe community. Is it the discerning feature that warranted the upsell? Or a casual touch to ensure protection from the elements in one specific area? The world may never know. 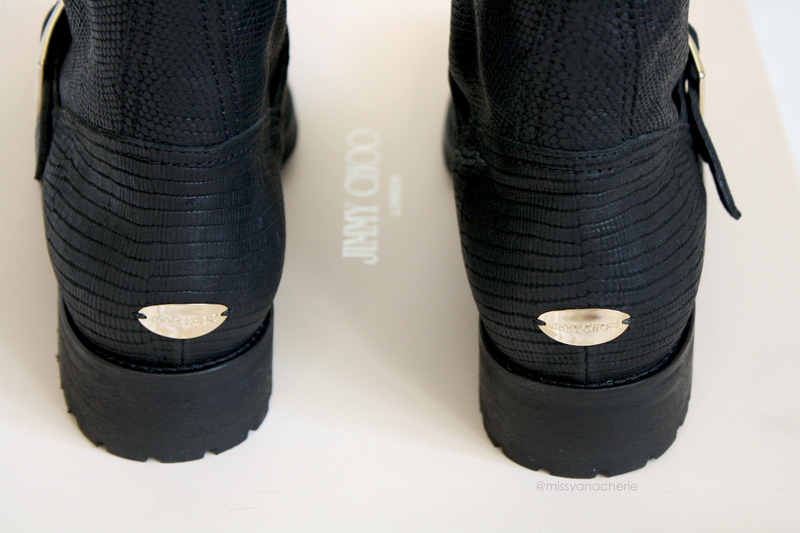 Of course, my boot wish list perpetually increases, so next on my wish list are these Alexander Wangs, these other Wangs, even more Wangs, as well as these Sensos. I was momentarily enraptured with these Saint Laurents, but beautiful as they are, they were too narrow for me. 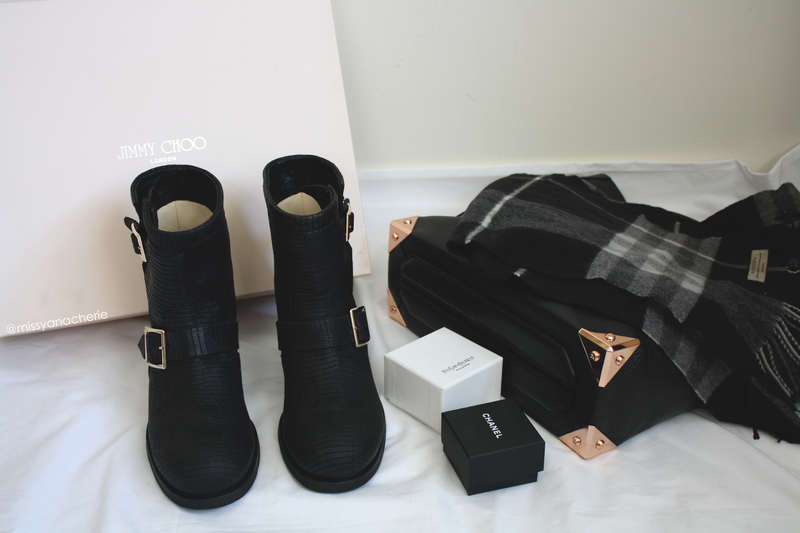 For anyone looking for a great heeled boot, I highly recommend both the Acne Pistols and the Rag & Bone Durham booties - they've been my go-to's for quite some time and both have manageable heels.